Project Beast: Breaking Down Shouldn’t Mean Having a Breakdown! 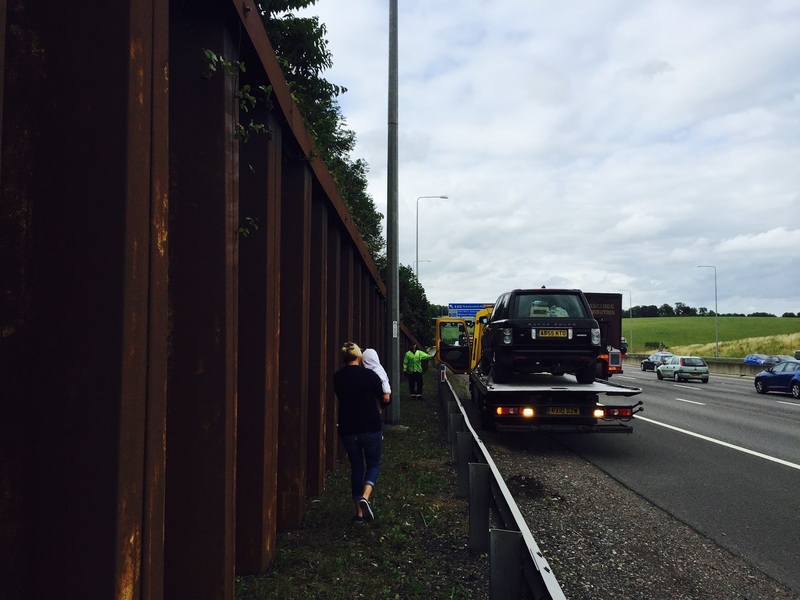 So, you think you’ve got breakdown recovery sorted? Think again! Yesterday, I had the wake-up call of wake up calls – breaking down in the outside lane of the M25 approaching rush hour, surrounded by wagons, with my wife & two-year-old daughter onboard (see picture of them cowering above, left hand corner) – and it’s prompted me to write this long but well worth a read we hope!) 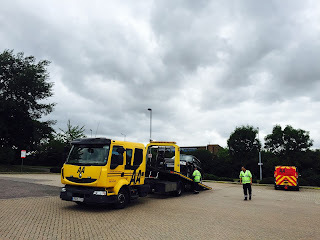 blog post about breakdown recovery. Read on… and act folks, I beg you! As the proud, but frankly, realistic owner of a big V8 Project Beast Range Rover, I’m not daft enough to assume it won’t let me down at some point. And as we’re usually in it as a family, and being stranded roadside with a hungry, tired or dangerously bored toddler ain’t on my list of fun Summertime holiday activities and being an organised chap who wants to look after his family, naturally, I’d arranged breakdown cover… or at least I thought I had. But what I’d actually done though was (incredibly stupidly in hindsight) agree to getting “breakdown ‘rescue’ cover” through my insurance provider and assumed this would be up to the standard of the services I’d previously received from specialist roadside recovery fleets, namely, the AA, whom I’ve been a member of for decades, prior to my “breakdown cover” being “included” apparently “free” in my car insurance policy. Sit Rep: It’s c4pm and we’re blasting back from Cornwall. We’ve travelled 300 miles. 100 to go. Outside (4th) lane of M25, rumbling along perfectly, about to stop at South Mimms services for fuel and a first break. Suddenly, the V8 cuts out. No warning. No drive. No power steering. Nothing. Uh-oh. Left indicator on instantly, followed swiftly by the hazards, and I cut fast like a BTCC driver defending his lead across four lanes of traffic, right in front of a tidal wave of HGVs, as the Range Rover coasted slower and slower. 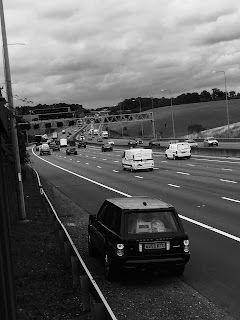 Thank God, the traffic was kind and I didn’t have to brake or slow at all – just manoeuvre onto the hard shoulder. I even managed to hit the hard shoulder where there was a gap to the left to pull into away from the traffic and by an SOS phone and multiple barriers. It was pretty manic – with the fear of potentially causing an accident with a powerless/nigh-on useless car and the two most precious things in my life onboard. Of course getting to the hard shoulder is only the half of it. The accident stats of people being being injured or even killed who stay in their cars (which is where you naturally want to stay) are frightening. But you MUST get out, fast, leaving your hazard lights on and getting behind what barrier protection there is ASAP, which we did (after quickly trying again to get the engine going, and failing, disappointingly). 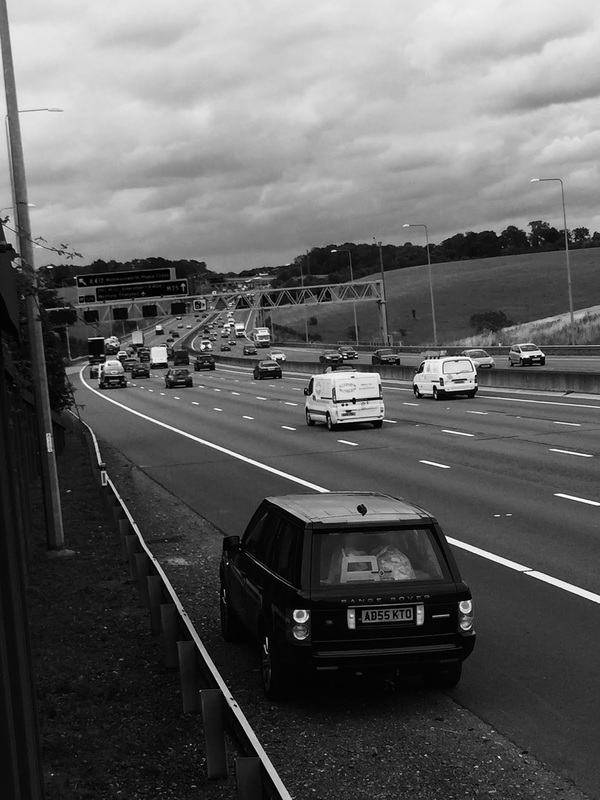 I have to say, walking alongside the UK’s busiest motorway, with your loved ones is a real life low. Plus, it’s pretty darn terrifying, as trucks blast past you at 70mph. And it’s totally deafening. So it’s no surprise our usually unfazed little girl was crying and gripping on to her mum like a limpet! Not great! OK. No worries. Keep calm. We’re out of the car. We’re behind the barriers. We’re as safe as can be. Call the breakdown service. They’ll sort it… right? 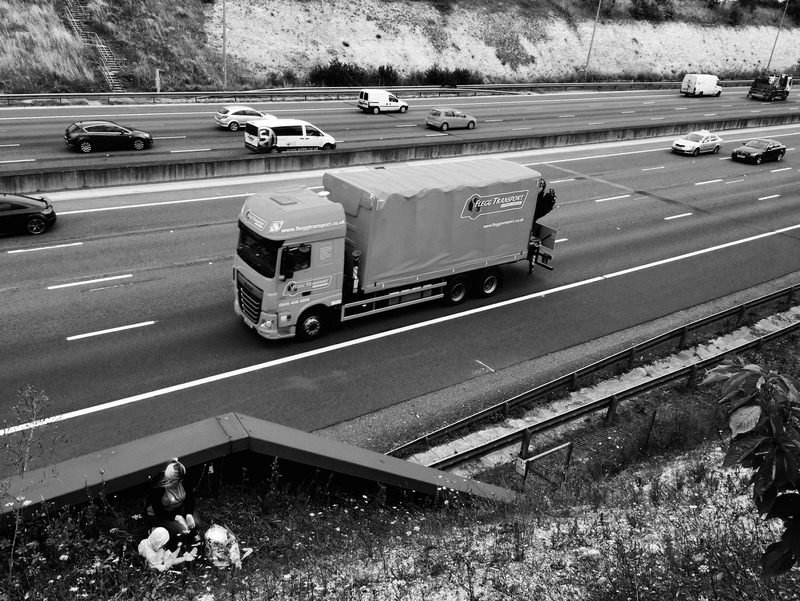 It’s not beyond expectations to think being stranded on the M25 in rush hour with a toddler would put you to the top of a pile and get a decent, fast response and some reassurance is it? But, after fielding a load of “essential” but clearly totally pointless questions for five minutes about my car’s engine size, tyre diameter and countless other twoddle from a surly, bad tempered, unhelpful operator – who did nothing to reassure us or offer any practical, useful advise, nor even knew what a Range Rover was (!) – the long and short of it was we’d be there for “about 90 minutes, maybe longer.” Oh, and “someone” would be texting us with a more accurate ETA. Total, and utter rubbish (or something much less repeatable) I replied, as I begged – to no avail – for something quicker, and better. It all fell on deaf, uncaring ears. And I literally couldn’t believe my ears – 90+ minutes, on the UK’s busiest motorway, with a toddler and a woman in tow, when we’re just outside the capital city. No way. Unacceptable. And I was aghast at the level of dreadful “customer service” we’d been given, all from a woman sitting in a warm, dry call centre, clearly with NO regard, or care for the situation let along interest or passion for her job. It was absolutely diabolical… and a real warning to anyone out there who thinks that their “recovery” service supplied with their insurance provider is worth anything but shoddy, miserable service. And once I had their name (by unbranded, vague text), even ringing the insurance company’s choice of second rate, farmed out, local recovery “specialists” who were “coming as fast as they could” to beg for a quicker response resulted in lots of being put on hold, more bad attitude and the answer that “it’s more likely to be even later than that.” Plus, to add insult to injury, they’d only be towing up to the services, for us to wait for another truck to take us home, at a further cost! I had to laugh… loud across four lanes of commuter traffic, like a mentalist! Severely underwhelmed with and let down by the unprofessionals – the cash-grabbing, dire-service charlatans of the insurance world – I decided on the only course of action that a sensible man would do… sack them off and call the professionals. The experts. The oldest, biggest and best roadside recovery company in the UK – the 4th emergency service. The AA. Could they be our knights in shining (yellow) armour? The difference in the service was like night and day. Instantly, I’m through to a reassuring, knowledgable, helpful, caring, kind and empathetic human being – who’s all over it. The relief is palpable. His first priory? To reassure us help is on it’s way. FAST! He’s all over the details of where we are, and in what car, with no need to ask me what coloured underpants I’m wearing. And the right sized recovery truck is en route while we speak. Phew! Then he makes sure we’re actually as safe as possible where we are – which includes very quickly running through the “hazard lights on, get behind the barrier, if you need to go back to the car in an emergency, belt up and be quick procedure.” It’s fabulous, expert service. He then explains the procedure, which will be a pick-up within 20 minutes, or sooner – as we’re emergency, top priority being a such a high risk spot, with a toddler (as you would be a woman on your own at night, an OAP in danger etc. 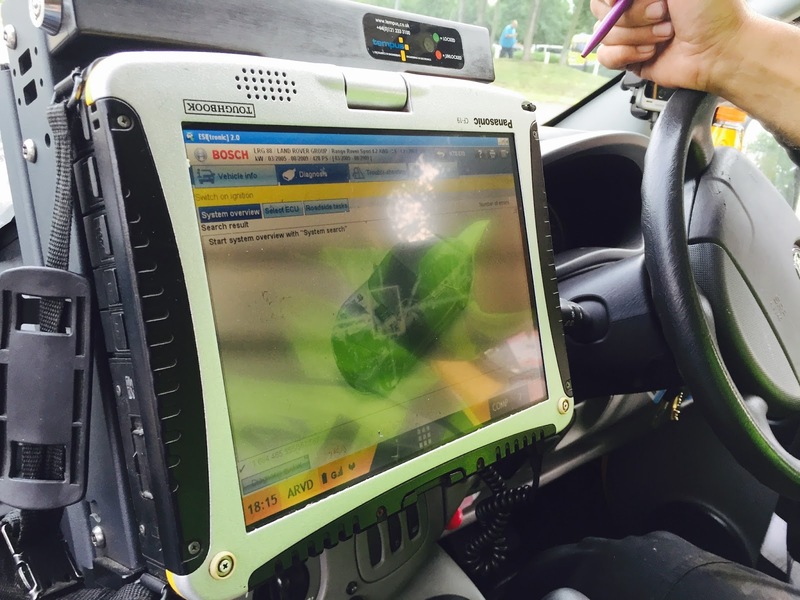 ), and he will safely transport us and the car to the nearest services at South Mimms, where a vehicle diagnostics roadside recovery expert will attempt to fix the car, or arrange onwards transportation home. Simples! The AA, as hoped for and expected, offered us utterly amazing service and just what you expect from the UK’s biggest roadside recovery fleet – consummate professionals, with real experience and expertise, not to mention care and a real pride in what they do. No wonder they say “you’re in safe hands” and offer such short wait times (AA patrols arrive within 45 minutes and fix roadside repairs within 30 minutes, on average), with unlimited call-outs and even assistance after accidents, as well as breakdowns, not to mention expert advice and a ton of exclusive membership perks (like 20% off Costa, Burger King, Eat & Drink and more at Moto service stations). True to their word (and with live updates on offer via their App) the massive, welcome sight of the bright yellow AA recovery truck arrived in just 20 minutes, to massive waves and cheers from us three, high up on the motorway embankment. And within five minutes, our first knight in shining armour, David Patston, had the stricken Range Rover on the lorry and us in the car – complete with the little one’s car seat ISOFIXED in the clean cab. The door was held open majestically for the wife & kid to get in safely on the nearside away from he traffic and we were off from the horror of the breakdown scene, heading for the services. The relief was incredible. God bless you AA! And David’s reassuring, caring manner and steady, safe driving of the HGV up to South Mimms, mixed up with good chat, banter, some potted life stories and good old fashioned camaraderie was just perfect. A few minutes later and we’re at South Mimms – being greeted by our second knight in shining armour, in the form of Elias Andreous and his truck of tricks. Our car is carefully, safely unloaded off David’s transporter and the wife and kid can go off for some well earned tea and calming-down time inside, while we check out what’s gong on with Project Beast. Elias is just as reassuring, helpful, skilled, passionate and dedicated as David and the chap (Andrew) we’d first spoken to by phone on the side of the M25. The core caring AA DNA runs through all their employees, clearly. And within seconds of the Range Rover being off the truck, Elias is asking me to describe the breakdown, inspecting the vehicle thoroughly and trying to get it started. He’s another “can do” sort of guy, restoring my faith in humanity. Rangey then bursts into life (yay! ), only to cut out immediately (boo!) with a dashboard full of warning lights. Not great. 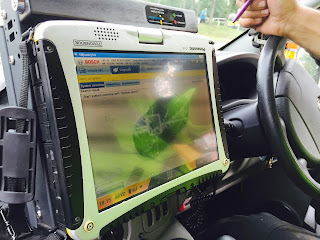 But Elias ain’t giving up, and he’s quick to plug in the Bosch diagnostics equipment, to read the fault codes – in a very trick way, via Bluetooth, no less. It turns out there’s a fuel pressure warning, mis-fires and all sorts. And it doesn’t look great, as the dash is still lit up like a Christmas tree. But, he ain’t giving up and calling for another tow truck just yet. Good man. 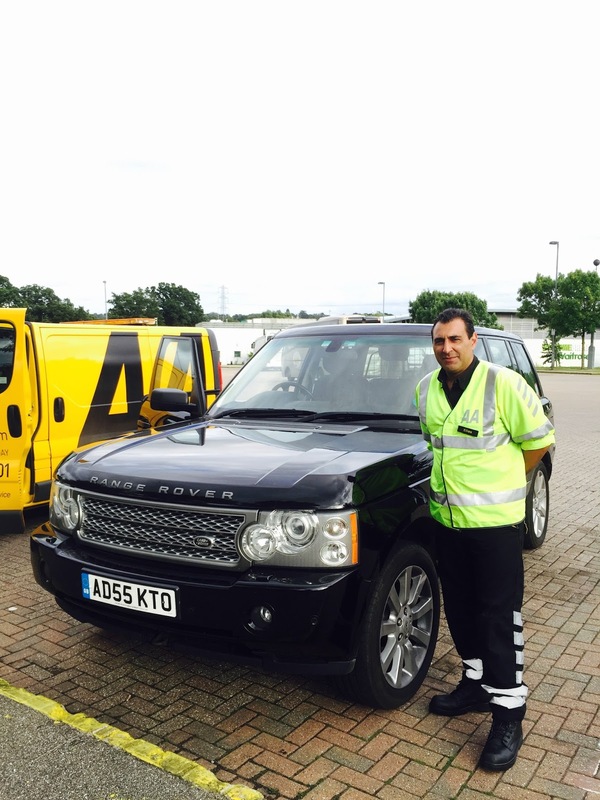 And, using his experience and know-how gleaned from many years with the AA and despite the fact the Range Rover’s computer says the fuel range is 68 miles, there’s no fuel light on and the engine cut out with no warning, Elias suspects a mis-read. He listens to the fuel tank through the filler, and it’s gurgling air and vapours. Then he pumps a fiver of fuel into the car and she starts up, cuts out, starts up again and misfires, until she’s roaring away delightfully, on all eight cylinders, sounding fabulous again. Hooray! And the AA have recovered us and fixed the car, in next to no time. Incredible! But the quality service continues. And, just to make sure it’s all OK, we go to the fuel station together, fill up and he stays to make sure all is well and clears all the fault codes again before we hit the road home again. 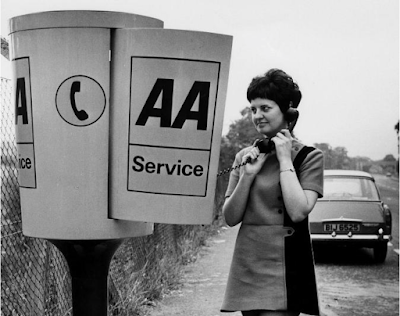 A utterly first rate service – from beginning to end. Palmer: “I don’t know sir. But one thing I do know is… DO NOT rely on your insurance company’s “recovery” service. It’ll be second rate, utter pants and stress city. Buy a proper policy, with a proper roadside recovery fleet and relax. And, after our superb experience, we’d recommend the AA with every bone in my body to anyone who will listen… as would 95% of their customers, which says it all really. Oh, and by the way, it transpires faulty fuel gauges, computer range reading errors and warning light failure is a common problem on Range Rovers, so be warned fellow L322 Beast owners. And stay at the full end of the massive tank. I’m now reading our gauge as empty at 1/4 full. And I’m also desperately trying to tell myself, it’s not my fault I ran out of fuel on the M25 and stranded my family! Thank you AA! I’m forever in your debt… and needless to say. Now a paid up member. And so should you be folks: You have been warned!!! This entry was posted in Project Cars and tagged AA, automobile association, breakdown, car breakdown, L322 range rover fuel reading issue, land rover, motorway car breakdown, Project beast, range rover, road magazine, road magazine project cars, running out of fuel, The AA. Bookmark the permalink.